Dan Rayfield is the State Representative for Oregon House District 16. House District 16 encompasses the cities of Corvallis and Philomath, and Oregon State University. Dan grew up in Oregon and is a product of the Oregon public school system. Following his graduation from Tigard High School, Dan attended Western Oregon University and then earned his law degree from Willamette University College of Law. As a child, Dan’s two contrasting parents had a big influence on him. His mother was an activist and a small business owner that often dragged her young and unwilling son along to various progressive events and protests. His father, on the other hand, was a colonel in the Air Force Reserve and an insurance executive that had more conservative views on matters. At a young age, Dan learned that while good people often agree on the outcome they want, those same people can just as easily disagree on how to get there. Having a supportive family, health care, and a good education has given Dan and his family opportunity in life. Now, as a parent, Dan is dedicated to making sure the same opportunities are available to future generations. It’s why he believes in high quality education for our children, access to affordable and reliable healthcare, and making sure families are able to earn a living wage while simultaneously nurturing innovation and supporting Oregon’s small businesses. In the Legislature, Dan has fought for Oregonians and their families by working to increase the quality of education we provide, to ensure that our economy provides opportunity for everyone, and to protect the values and rights of all Oregonians. Dan is committed to making Oregon the best it can be for his family and yours. These same values have also steered Dan’s volunteer work in the community as a commissioner on the board of the Linn-Benton Housing Authority, as a member on the New Roots Housing Board, and in his other community volunteer roles. He is tied strongly into the House District, having acted as a former coach attorney for the OSU Mock Trial Team, a former Linn County Peer Court Judge, a Past President of the Linn-Benton Bar Association, and a Past President of the Majestic Theater Management Board. Outside of the Legislature, Dan is a partner in the law firm of Nelson MacNeil Rayfield. 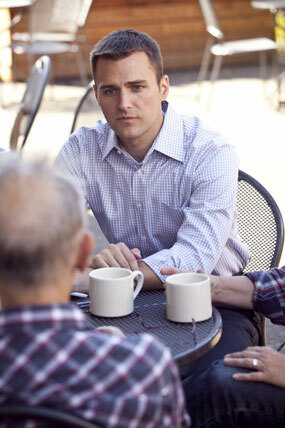 Dan’s practice focuses on protecting individual and consumer rights, and civil rights cases. As an attorney Dan has been a problem solver with the ability to bring parties together to reach a resolution. This is a skill that has been transferrable to the Legislature, helping him to tackle the issues we face as citizens, as parents, as families, and as a state. Dan lives in Corvallis with his wife Amanda and their son Adam.